Since 1991, Cadence® Virtuoso® technology and tools have been at the forefront of custom and analog designs, helping countless engineers and electronics manufacturers bring ideas to life and products to market. As we celebrate 25 years of Virtuoso technology, let’s take a look at how products like Virtuoso Analog Design Environment, Virtuoso Schematic Editor, and Virtuoso Spectre® Circuit Simulator came to light. real-time parasitic extraction during layout. In the early 1960s, most things were done by hand. Electrical engineers designed circuits using pencils and slide rules. Mask designers did the same, cutting shapes out of rubylith to create the shapes that would eventually become photolithography masks. Virtuoso technology was first released to customers in 1991, as the layout tool for mask designers. 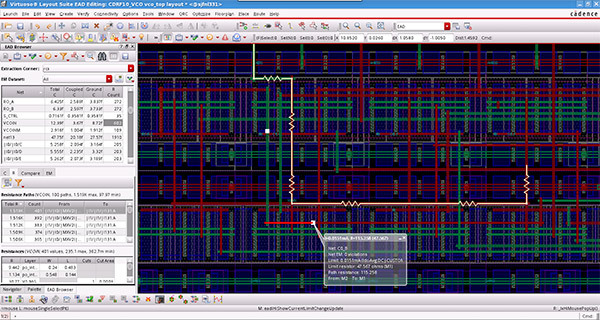 It was part of the Opus Platform, which delivered a new level of integration between design tasks, from circuit design and simulation to layout design, design verification, and the merging of analog and digital design. Cadence has built on this foundation for more than 25 years. Today, Virtuoso is the platform name for the suite of solutions for any design challenge, from formal analog verification and formal constraint management to electrically aware design and FinFET design. Over this year, Cadence will announce new and innovative Virtuoso products to set the stage for the next 25 years of IC design. Let's hear your Virtuoso story! Do you still remember the first product you designed with Virtuoso technology? How did Virtuoso products influence your work and your career? Share your Virtuoso story with us by July 31 for a chance to win a Beats solo2 wireless headphone!